Like any art, learning to fight with firearms requires studying under knowledgeable instructors and teachers, which takes time and money – precious commodities for most of us. To get the greatest return on your investment you need to focus on 3 areas – preparation for the class, participation during the class, and post-class follow through. Preparation includes selecting your class, making travel plans, and acquiring the necessary equipment. 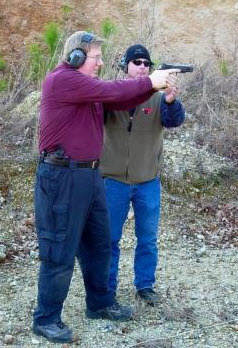 Your anticipated use of your firearm and current abilities should dictate the class you attend. If you’re interested in self-defense you don’t want to attend a class on competitive shooting. Choosing an instructor or school is important for both beginner and experienced student. For a new student the training should be a gratifying experience and get you started in the right direction. For the “gun-school-junky” the instruction should fit the fighting doctrine you already have developing. A great source of info on instructors and schools are firearm forums on the Internet and reviews in magazines. After researching a school, contact them to talk about what you are looking for in instruction. When discussing your training be careful about overestimating your current abilities. The majority of defensive instruction is based on you knowing the fundamentals of marksmanship the basics of how your weapon functions. Without this knowledge you’ll start out behind, quickly become frustrated, and won’t benefit from the instruction. Get detailed information on the registration process. Most schools require applications, copies of CCW permits and such, and partial or full payment. Please, send in all the required paperwork. Don’t just shove a check into an envelope and mail it in, even if you have been to the same school 12 times before. After a week or so confirm your registration. Now that you’ve booked your class it’s time to make travel arrangements. Wait until the last minute to book flights, hotels, or rental cars and you may discover a jazz festival the same weekend of your class and everything is booked solid. When booking a flight check the airline’s policies for flying with firearms. Normally you’ll need more ammo than you can fly with, so buy and ship ammunition in advance, with time to confirm its arrival prior to the class. If you are driving to a course check each state you pass through for their laws on transporting firearms. Use the time between registration and the class to physically prepare yourself. Fighting “bad guys” for a few days is physically and mentally demanding, especially if you normally sit behind a desk 40 hours a week. Go for long walks, use small dumbbells to exercise your arms, and work on stretching out and developing some flexibility. Every class I’ve ever attended had an equipment list. And I can tell you as an instructor a major source of frustration is students showing up without the proper gear. In part II of this series we’ll look at gear you’ll need to make your training better. Every class I’ve ever attended had an equipment list. If it’s on the list bring it. You don’t want to be “that” guy in the class that everyone remembers for the wrong reasons. I normally start gathering and packing gear at least two weeks before a class. This insures you have everything you need, and that it packs up compact enough to fit your travel plans. Part of training is about evaluating your equipment, discovering how to operate it properly, and its advantages and disadvantages. But don’t go to class with new equipment that hasn’t been tested. With a new weapon you need to fire it enough to insure it’s functioning properly, which means at least two or three hundred rounds. At the same time you’re also confirming your ammunition and magazines are working properly. I’ve seen people come to class with ammo they never tested, and they didn’t discover it wouldn’t function in their weapon until the class started. With anything that can break or fail, carry a spare. Don’t try to do a two-day course with three different weapons. You’ll have plenty to think about without trying to remember which pistol you’re shooting. Using one type weapon allows you to focus on the important lessons, plus it cuts way down on the amount of gear you have to carry. I use two range bags to pack my gear. I have a large bag that holds gear I may need. This is where I carry my rain/cold weather gear, elbow and kneepads, spare mags, cleaning gear, batteries, and small tools. I also keep a little snack in this bag. You tend to work up an appetite shootin’ bad guys. 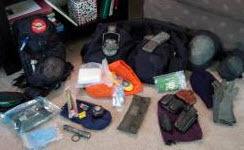 A spare holster, belt, pouches and notebook with pens also go in the big bag. Anything that might be affected by rain goes into plastic zip-lock bags. I have a small range bag that I actually carry with me on the range which fits into the big bag. The small bag holds stuff I know I’ll need such as eye/ear protection, flashlights, sight tools, lights, and a first aid and trauma kit. If you’re a regular guy or gal training to defend your family don’t show up for class decked out in yards of Velcro and black tactical gear. When you’re attacked in a dark parking lot you won’t have that tactical vest and thigh-rig holster. 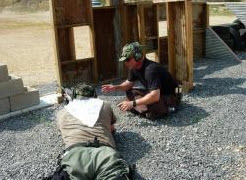 Armed professionals should train with the gear you normally operate with. During class don’t hesitate to ask other students about their gear. This is an opportunity to get opinions from people actually using the gear before you buy something. Electronic earmuffs should be considered mandatory. Earplugs don’t really protect your hearing; the area right behind the ear is where a lot of damage can occur. Regular muffs protect this, but you can’t hear commands. The electronic earmuffs are affordable and recommended. In part III of this series we’ll discuss the class itself and post-class actions, where the learning really starts. You can do anything if you put your mind to it, which means slow down and focus on what the instructor is asking. After all, it may be a better technique or tactic, and if lives depend on your performance wouldn’t you want to be as good as possible? On the range stay focused and don’t let your mind wander. Shut your mouth, open your ears, and pay attention. Don’t get caught up competing or comparing your performance with other students. It’s good to observe other people performing, this is one of the ways we learn, but what they can do on the range won’t really matter in your fight. When the instructor provides you with corrections during a drill it’s not the time to get into a lengthy debate. Hold your questions until a break and then get clarification. After all it’s your class, and you shouldn’t leave with any questions unanswered. Other students will also have questions so don’t hog the instructor’s time. I highly recommend taking notes during your class. There will be a lot of information presented, too much to try to remember, at least for me. I have training notebooks from all my classes. During class I make notes, and at the end of the day I recount the training in detail. “The Book of Two Guns” is actually my main notebook covering ten years of classes. During class do not participate in anything unsafe. There are plenty of ways to induce stress into training without increasing risk. 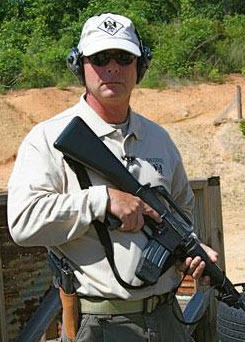 Everyone on the range, including you, is a safety officer. If you see something unsafe you need to correct it immediately. Training safely is paramount. After class is when the real work begins. Training, the introduction of new techniques and the reason you attend class, and practicing, when you actually learn and refine your skills through repetition, are two different things. Without practice you won’t actually learn, you won’t see any improvement in your skills, and they’ll deteriorate over time. A little work will maintain your abilities, but improvement takes regular practice. Practice is also the time to experiment with new or modified gear. When you decide to invest in training you are entering into a contract. For the school to do their part you have hold up your end of the deal. You can book a class with the best teacher in the world, but if you’re not prepared physically, mentally and with the right equipment you’re wasting both parties’ time. You can always make more money, buy more ammo and gear, but time is a precious commodity. Spend it wisely.